Update: Apologies, but the gift count here is just for Team Fortress 2, not Steam. We apologize for the confusion. Sure, you've probably given a gift or two on Steam. Maybe you saw a game you really wanted your friend to play on sale, and you picked it up and gifted it. 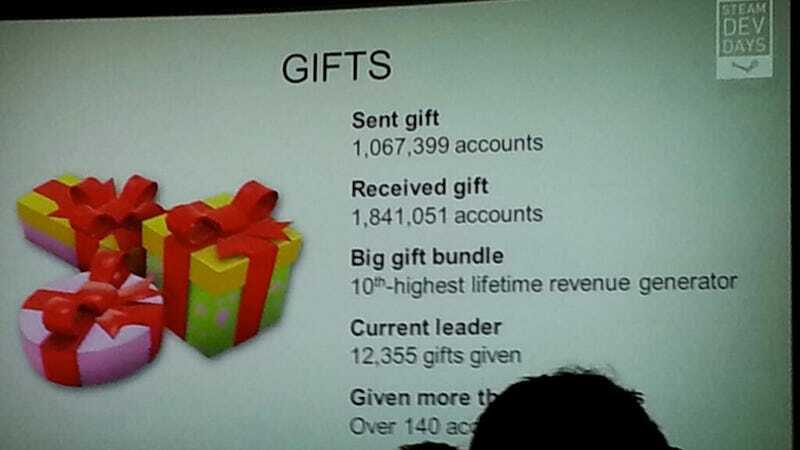 But unless you've given more than twelve thousand gifts, you aren't even close to Steam's top gift-giver. The picture above was tweeted by game developer Rotondo, snapped today during a Valve presentation at their two-day Steam Dev Days conference. The conference has summoned game developers to Seattle to learn more about Steam, Steam Machines, and Valve's vision for the future of PC gaming. The presentation slide offers no indication of who the generous soul is, nor any specific information about the kinds of gifts given or their value. But to whoever you are: Godspeed. Note: The original headline of this piece was Someone Has Given Out 12,355 Steam Gifts. We've changed it after receiving feedback that the slide only referred to Team Fortress 2, not Steam overall. Thanks to Martin Benjamins for the heads-up, and to Rotondo for confirming.